Save £1000's online and in store and you can register free and start savings online straight away. 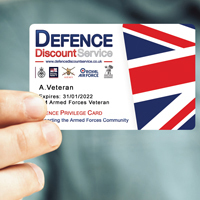 The Defence Privilege Card is the vetted discount card that can be used in stores. 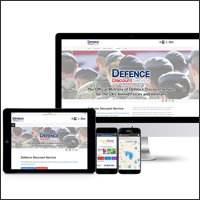 Defence Discount Service provides those in the Armed Forces, Veterans and the Defence Community with discounts both online and in store. The Defence Discount Service also allows small and large companies to get involved with offering a discount and encourage companies in local areas to offer discounts to the Armed Forces Community. There are hundreds of online discounts to help those in the Armed Forces, Veterans and the Defence Community save. We are the home of many official discounts from large national retailers and have a wide range of offers from things such as holidays, cars, days out, fashion, gifts, insurance, phones and many other items. The website is free to sign up to and to use the online discounts. The Defence Privilege Card is the official recognition card that can be used on the high street in order to obtain a discount. It allows those not currently serving in the Armed Forces to obtain discounts and gives them a card to show that they were in the Armed Forces or are currently in the Defence Community, as a spouse/partner of someone currently serving for example. Each Defence Privilege Card is personalised for the member and it costs £4.99 for a 5 year membership. Hundreds of online discounts available on everything from cars to hotels to gifts to attractions and more. Receive discounts on the high street with your MOD90 or Defence Privilege Card. 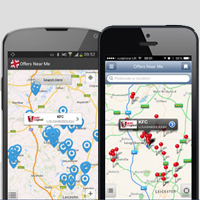 Download our free mobile app today to help you save on the go.